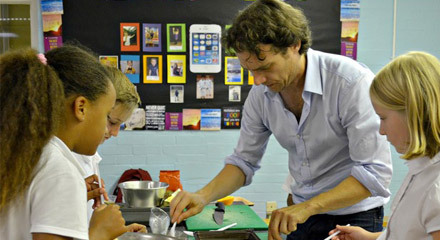 CHILDREN from four lower schools were treated to a cooking lesson from healthy eating advocate Oli Blanc last week. Based on his father, renowned chef Raymond Blanc, Oli has created the lovable Henri Le Worm to teach children the value of fresh and healthy food. Henri and his host of insect friends aim to encourage children to cook simple and nutritious meals at home with their families. Students from Bromham Lower, Ursula Taylor Lower, Carlton Lower and Pinchmill Lower Schools met with Oli last week to find out more about health, cooking and growing their own fruit and vegetables. Pupils grilled Oli about his favourite foods and what he grows in his garden, before helping him cook a healthy fruit pudding. 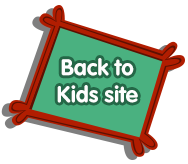 Head teacher of Bromham Lower School Mrs Gilks said: “Eating right is a big part of our ethos, we have a vegetable patch and even keep chickens here at school so Oli’s visit was a real treat for children and teachers alike. “It was fantastic to see the our students engage with the idea of health eating. Henri Le Worm offers lesson plans, an interactive website, recipes, and an award winning app for teachers, students and parents in order to support a cross curriculum approach to learning about food and promoting a happy and healthy lifestyle. Councillor Henry Vann, portfolio holder for Education said: “Food and health education in schools supports our aim as a council to provide a bright and environmentally sustainable future for all children in Bedford Borough.